What if the empowerment through service provided by buildOn’s after-school youth programs was applied to the entire school day? The newly initiated Youth Engagement Zone (YEZ) at Banana Kelly High School, funded by a grant from the National Corporation for Community Service, will answer that question. A dedicated team of buildOn educators, under the leadership of Stephanie Gilman, is working directly with Banana Kelly’s teachers and administrators to fashion a series of service learning programs. Unlike buildOn’s other afterschool service projects, however, these programs will be fully integrated with Banana Kelly’s classroom curriculum. Designed as an Attendance Improvement Dropout Prevention solution, the YEZ won’t just engage youth with their community: Banana Kelly students will interact with fundamental academic principles and earn school credit. buildOn’s programs reach out to the toughest districts and neighborhoods in the United States, and the Youth Engagement Zone is no exception. Banana Kelly High School is situated in an especially troubled area of New York’s Bronx borough; 55% of inhabitants receive some form of public assistance, 49% of all families are living beneath the federal poverty line and the unemployment rate (24%) is the city’s highest. But with the YEZ, buildOn plans to harness the passion of Banana Kelly’s community through service, setting the stage for empowerment and broader social change. Education through the YEZ will take on various forms in an attempt to get as many students involved as possible. All ninth grade science classes, for example, have been replanned in collaboration with community partners, such as Bronx River Alliance Bronx Green Up, Bronx Community College and Million Trees. 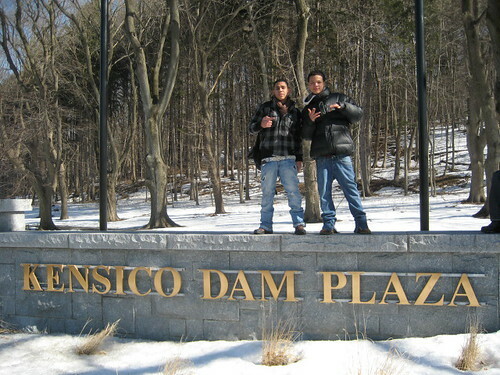 Students have already enjoyed field study at Kensico Dam, and the school paper will be publishing their findings. The program also reserved 15 internship placements for seniors in good academic standing at local institutions like La Peninsula Head Start, Bronx Charter School for the Arts and St. Vincent’s Senior Center. The YEZ plans to reach out to students with low attendance in collaboration with the Children’s Aid Society using service learning projects. All current buildOn programs at Banana Kelly will additionally be expanded, and leadership workshops will develop a core group of student mentors and buildOn ambassadors. And beginning in the fall 2011 semester, a 10th grade elective course in community health will address issues such as asthma, adolescent HIV/AIDS and diabetes while integrating social studies and/or English curriculum. Perhaps most notably, Banana Kelly will hold three annual school-wide service events where every single person on campus will be engaged in service to their community. Students and teachers alike created mural designs about diversity and community during the first 2011 event, “Paint 4 Change”. The YEZ is an opportunity to create a dynamic, youth-driven community around Banana Kelly High School, and show everyone in the Bronx the empowering importance of local service and activism. With the leadership of principal Joshua Laub and the buildOn team, buildOn believes the YEZ could transform education in New York City. We’ll be offering frequent updates on the YEZ, closely tracking the progress of this exciting new service learning experiment. Check back in for updates, and look out for “Youth Engagement Zone” in our category list!